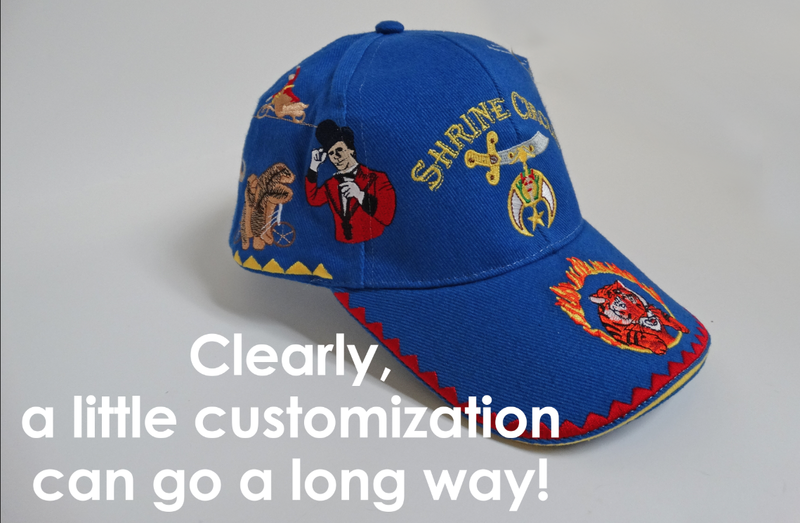 Upsell: To work creatively with a customer in order to suggest additional embroidery that adds customization to their design and a unique quality to their embroidered items – enough, perhaps, to evoke compliments and comments. And dare I say it: WOW! And when it comes to embroidery, where stitch count is your price provider, the more stitches you can talk your customer into paying you for, the better. And so, you’ll want to pay a lot of attention to the person (customer) who stands before you. What kind of car did they drive? Any bumper stickers? Do they have a pet on a leash? Regardless of what they are looking for to be embellished, further customization is nearly always possible. With your larger customers, who may be having shirts or caps embroidered with a logo, are they celebrating a special event? An anniversary? Do they support a particular charity or local organization? Are they aware that there are more than just left chest or cap fronts to brand? While you are not looking to make a simple job overly complex, it never hurts to suggest a little creative placement of slogans or dates. And personalization is so “in” right now! To call it a trend may be too bold, but most folks love to see their name or initials permanently added to a favorite article of clothing. Think of suggesting it to the next person who comes in looking for branded items for their company picnic. By providing something unique and creative to their boss, you make them look like a hero, which almost guarantees their coming back to you the next time a project is on the table. To read more on this subject, see Impressions magazine, August issue, page 48. Or click here. Know Your Caps and Keep A-Head of the Competition! So, your customer comes into your shop and says, “I need about 150 caps to give out to customers.” And you say, “What kind of caps?” and you get a blank stare. Yikes! You need to give the customer a quick cap tutorial and then steer them in the right direction. FIVE PANEL CAPS: The most distinctive feature of this cap, besides the very wide front panel, is the relationship of the front panel to the visor. View the cap from the side and you can see that there’s almost a 90-degree angle where the front panel and visor meet. PRO STYLE SIX PANEL CAPS: The unique features of these caps are the front middle seam (which makes it a little more challenging to embroider). Viewed from the side, the angle of the front panel to the visor is almost 90 degrees. UNSTRUCTURED CAPS: Sometimes called easy riders or skullcaps, they fit close to the head so the angle of the front panels to the visor slopes back towards the head and is greater than 90 degrees. SLOPE CAPS: These caps are six panels with a seam in the front and when viewed from the side the front panels, slant back towards the head, creating an angle to the visor greater than 90 degrees. So now that they understand the 4 basic shapes of caps (of course, you are showing them embroidered examples), briefly explain to them (with your examples) how the caps are constructed. CROWN this is the top of the cap that consists of 5 or 6 panels, which are sewn together and then the seams are taped over to prevent the material from unraveling. There is usually a “button” on top to finish and protect it. VISOR is the piece that sticks out on the front of the cap and shades the eyes, unless the cap is worn backwards (which in my opinion looks adorable on children, cute on teenagers and stupid on adults; but that’s just MY OPINION). There are at least 100 million caps sold annually in the US. The population of the US is about 320 million, but not everyone wears caps. The total number of people in the US who wear caps could be about 40 to 50 million. That means for every person who would wear a cap there will be a couple of caps sold each year for every person who wears caps; and this is cumulative, meaning that they collect caps every year. So here is the money question: if each cap wearer has a choice of wearing any of 9 or 10 caps (whether given to them or purchased) WHY would they want to wear the cheapest cap that you or your customer can find? Most cap wearers have a favorite cap. Suppose your customer buys a cheap give- away cap for $3.95 and has their company's name embroidered on the front and the person they give it to wears it just one time. Their advertising cost per exposure is $3.95. Now suppose they pay $15.00 for a better cap. The recipient likes its looks and when he puts it on, it does not dig into his forehead and rests comfortably and feels good. The recipient likes the cap and wears it maybe 100 times. He gets some compliments – Hey! Nice cap; where’d you get it? This isn’t unusual; if a person likes a cap they wear it non-stop. So the cost per advertising exposure is $.15. The conclusion your customer will come to is pretty apparent: it’s better to pay $.15 for advertising than $3.00. (Even if the numbers and arithmetic are a little shaky – you get the point). Here’s an idea that may work for you if the budget just isn’t there. Get your customer to split their order between inexpensive (cheap) and higher priced caps. If they want 150 cheap caps you can suggest they get 120 cheap give-a-ways and then 30 custom caps for their best customers or personal friends. Make sure your name is in all the caps but especially in those special caps because they may end up in the hands of decision makers in other companies. By having your customer buy a few custom caps you have them showcase to other people that you can supply something other than a plain giveaway (throw away?) product. This is what can set you apart from the crowd. Madeira USA and master/digitizer embroiderer Erich Campbell recently produced an hour-long webinar about embroidering on caps. You can see a recorded version here or download a printable version of the slide presentation.